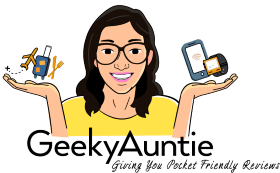 We operate http://www.GeekyAuntie.com (the “Site”). This page informs you of our policies regarding the collection, use and disclosure of Personal Information we receive from users of the Site. We use your Personal Information only for providing and improving the Site. By using the Site, you agree to the collection and use of information in accordance with this policy. We may use your Personal Information to contact you with newsletters, marketing or promotional materials and other information that might be of interest to you. If you like to opt out of the the communications material, do kindly inform us. The Site and all of the articles, reviews, comments, images, logos, sounds, and other materials on the Site, (collectively “Site Content”), are protected by copyright and other intellectual property laws. You may not reproduce, republish, distribute, display, perform, transmit, sell, or otherwise use any Site Content without our express written permission.